In another significant liturgical turn at the very top, B16 will celebrate tomorrow's annual Sistine Chapel Mass for the Baptism of the Lord in the ad orientem stance -- that is, facing away from the congregation and toward the cross that stands at the chapel's back wall. 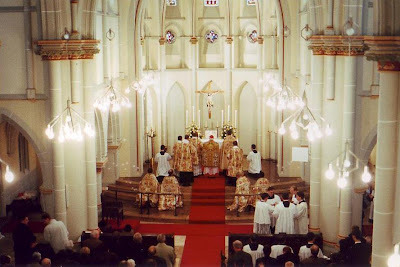 In an explanatory note from the Office for Papal Liturgical Celebrations picked up by the Italian wires, the papal MC Msgr Guido Marini announced that the Mass, to be conducted according to the post-Conciliar "Ordinary Use" approved by Paul VI, would employ the main altar of the Sistina. As a result, the note said, "at certain moments the Pope will have his shoulders [back] to the faithful and his gaze toward the Cross." As the chapel's original altar is not freestanding, versus populum celebrations there have required the construction of a temporary altar and platform. While John Paul II celebrated his first Mass after his 1978 election using the permanent altar and no freestanding altar exists in the Pope's private chapel, a public papal liturgy has not been celebrated using the "common orientation" in recent memory. "The celebration at the old altar is being restored so as not to alter the beauty and harmony of this architectural jewel," the note said, "preserving its structure from the celebratory point of view and using an option contemplated by the liturgical norms." The change of orientation, Marini's statement said, would seek to enhance "the attitude and disposition of the whole assembly." The annual liturgy features the baptism of several infants by the pontiff. The contemporary baptismal font designed by Lello Scorzelli -- also the designer of the pastorali, the cross-topped liturgical staffs used by Paul VI and his successors -- will likewise be maintained. Also this morning, the Pope named Alabama-born Msgr Joseph Marino as apostolic nuncio to Bangladesh, elevating him to the rank of archbishop. A two-decade veteran of the diplomatic corps who's served until now as second-in-command at the papal mission to the UK, Marino is the first native Southerner named a bishop in the direct service of the Holy See. Ordained for the diocese of Birmingham in 1979, the archbishop-elect turns 55 later this month. The appointment returns the number of US-born mission-chiefs to six. The others are Archbishops Edward Adams (Philadelphia) in the Philippines, Thomas Gullickson (Sioux Falls) in the Caribbean, Charles Balvo (New York) in New Zealand, Fiji and Samoa, Michael Blume SVD (Fort Wayne) in Benin and Togo, and James Green (Philadelphia) in South Africa. A native of Cleveland, Archbishop Timothy Broglio was serving as nuncio in the Dominican Republic until his November appointment as archbishop for the Military Services USA. The former chief of staff to the Secretary of State, Broglio returns from Santo Domingo next week, days before his 25 January installation in Washington's Basilica of the National Shrine of the Immaculate Conception.